Once again a solid and entertaining SciFi. This movie was thrilling because of two things. The feature of time traveling has already been used several times, but the fact that people are sent from the future and then being eliminated by a “Looper” is unique (Maybe I’m grossly making a mistake but I’ve never encountered this in another movie). 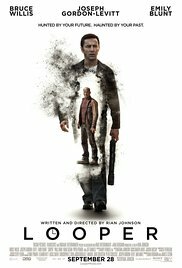 The Looper is sent on retirement after his alter ego returns from the future loaded with gold. Tricky but ingenious. The acting of Pierce Gagnon as Cid is extremely sublime and at times surprising, knowing that he’s still such a little fellow. Those eyes that look up at the young Joe while asking if he killed people allready. And that frenzy look at the end when confronted with Bruce Willis. Such acting by a little kid. Superb. The rest of the film was quite entertaining. Not very original, of course, and already used in other movies, namely changing the future by making drastic changes in the present. Whether there are errors in it or not, it always leads to banal and philosophical debates where nobody knows what the outcome will be. To me time traveling is and will always be impossible. That’s why it’s called SF. The setting and scenery was alternately. It looked brilliant with a Blade Runner-like feeling and sometimes it looked awful like the cars with those pasted solar cells and a pipe (I think they found it in a cheap Radioshack store) to the fuel tank. The Star Wars-like flying motorcycles were beautifully designed. Willis performed like an average actor and once again I felt like they used him to give this movie a particular standing. Gordon-Levitt pleasantly surprised me and fitted perfectly in his role from the beginning. He reminded me several times of Gigolo Joe from AI with his plastic appearance. Conclusion : “Looper” is a mix of “Twelve Monkees“, “Terminator” and “Firestarter“.